The richness and diversity of life in a tropical rainforest is staggering. Huge butterflies glide like frisbees, multicoloured birds chorus overhead. In places, the trees are so tall and dense that it’s almost dark Tat ground level. But wherever a giant falls, a sunlit clearing is made. Opportunistic plants pop up and, in a matter of weeks, their flowers and fruit will attract butterflies and birds. We can draw inspiration from such spontaneous natural gardens — just look at the Wilmots’ wildly ferny plot near Bristol, featured in this paper earlier this month. Visit Great Dixter in East Sussex or Powis Castle in mid-Wales, to see dramatic groupings of torrid zone plants. Or look to Norwich, where a talented chap called Will Giles has turned his entire oneacre garden into a tropical paradise (exoticgarden.com). It’s all to do with lush planting. You can create an exotic feel by grouping big pots on a patio and planting them all with ginger lilies, tall cannas, bananas or bamboos. Tropical-looking plants tend to be fast growing with flexible stems, so you can train them to tower above pathways without obstructing paths or blocking out vistas. If you want to ‘jungle up’ an existing border, dot it with such outsize plants as potted palms, tree daturas (Brugmansia) or the giant grass Arundo donax. Large succulents work well, too, especially hardier aloes such as Aloe striatula or spiky-leaved yuccas. In our mildest areas the hardiest banana species, Musa basjoo, should get through winter. In cooler regions, bananas can often survive if you wrap their stems and growing tips with straw held in place with polythene sheeting and string. Once you’ve set out your biggest plants, the rest is just summer in-fill. Tall, single-flowered dahlias are brilliant. Mix these with such fast-growing exotics as Ricinus, constant-blooming Lantana, mauve Alyogyne huegelii and deep purple Tibouchina. A greenhouse or conservatory will be essential for over-wintering non-hardy plants like these. But many are exceptionally fastgrowing and can be over-wintered in a dormant condition. Cannas and ginger lilies (hedychiums) can be cut back and their rhizomes wrapped up and kept frost-free. Speedy shrubs, if rooted from small cuttings now, will produce serviceable plants for going out next May. Certain hardy plants look wonderfully tropical, especially if blended with exotics. African Eucomis or pineapple lilies look terrific, as do tall blue agapanthus and huge pink or white-flowered Crinum powellii. The autumn-flowering Kniphofia caulescens has almost aloe-like blue-grey foliage and ramrodstraight, red hot poker flowers. The foxglove tree, Paulownia tomentosa, can even be pruned for special effects. Allow it to grow naturally and it becomes a tree with showy blossom. But cut the young sapling to a stump each winter, and the soft summer shoots carry spectacular leaves. I would also include extra-tall Rudbeckia laciniata or its huge hybrid, Herbstsonne. Though hardy, the towering cone flowers enhance tropicality no end. I’d team these with Salvia confertiflora and perhaps, tall, huge-flowered cardoon. And don’t forget tropical climbers. 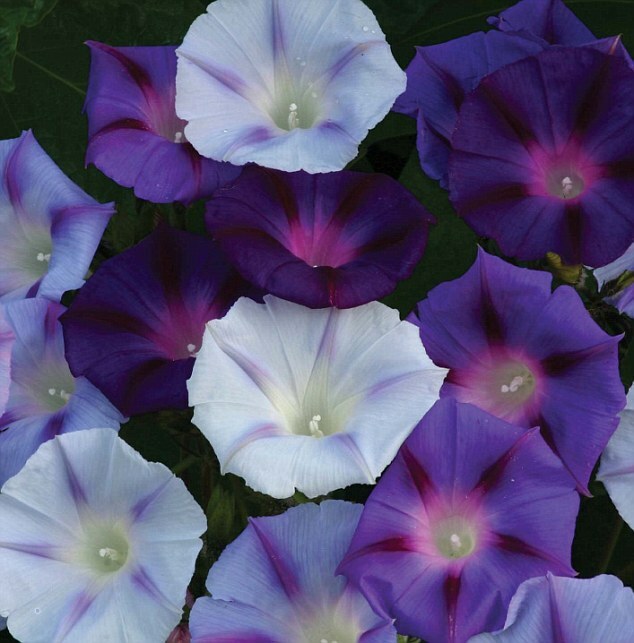 Purple or blue morning glories scramble everywhere in the tropic world, making a change from boring white bindweed. 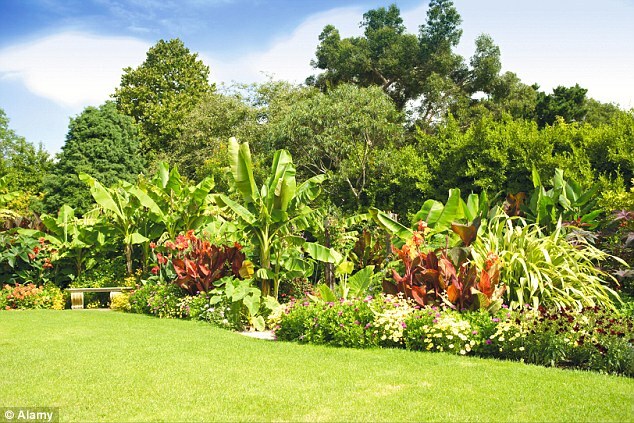 Developing a lush exotic look is to do with plant shape and habit, rather than geographic origins. So even if you’re unwilling to cosset tender plants through our winter, that does not preclude you from developing a glorious jungle in your own back yard.